Lichtspeer – Games for Android 2018. Lichtspeer – Throw thy spear true. Do you like chucking javelins? If your answer is no, why are you even reading this? 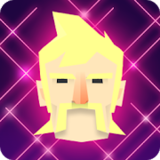 Lichtspeer for Android is a game where you chuck spears at the undead like it’s your job. If your job is to stay alive, that is. I’ll be upfront, this is one of those games that plays a lot better than it actually looks. And I believe part of that is the amazing presentation of the entire package. It starts off with the great music. As soon as you start the game, it recommends you put on headphones for the absolute banger you’ll be listening to for pretty much the entire game, or at least as far as I got. The song just gives off this epic feel as you throw spears into the skull of your enemies. The controls are really great, too, which I was afraid of. You’re given a curve that shows you where your spear will land and it’s your job to aim it true. There are different times of enemies that will all challenge you in different ways. Some are fast, some will come at you in large numbers, some fly and others just have a ton of health. As you kill, you’ll go further and further into the game, which is fortunately broken into levels. Overall, Lichtspeer is pretty great, thought the price tag is a bit hefty for what it provides. The game feels a bit too arcady for me to really get into and put any large amount of time into. Still, the entire package is fun.